The Well-Read Redhead: Where dey at, doe? But seriously...where The Well-Read Redhead at, doe? Apologies for the blog silence. What a crazy month! Small Fry started up preschool again, as well as soccer classes, so the transition there has kept us quite busy. Tater Tot and I have started attending a music class for toddlers during Small Fry's school hours, which is fun. My husband and I celebrated our 8 year anniversary last week, and actually got to go on a REAL DATE for the first time in a year! All of this schedule juggling has left little time for reading, and even less time for blogging. I'm currently reading 2 books, but both are rather slow going. 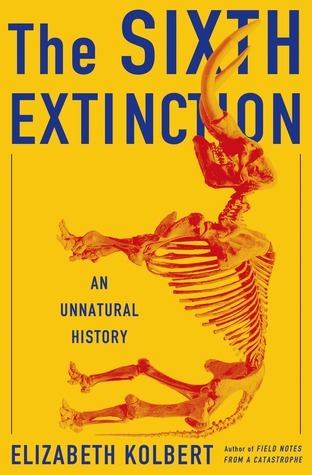 The first is The Sixth Extinction by Elizabeth Kolbert (reading it as part of Katie's Nonfiction Book Club for this month). I was DYING to read this beforehand, but it is proving to be a slower journey than I originally hoped. The material is interesting, but the organization of the chapters makes much of the information feel disjointed. I'm hoping the last third of the book brings all of her concepts together a bit more clearly. 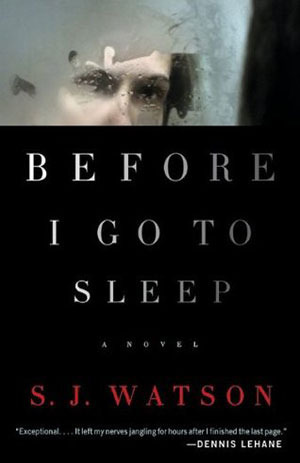 The other is Before I Go To Sleep by S.J. Watson, my book club's current pick. Our meeting is Sunday and I'm getting worried that I won't finish in time! I think the concept of the novel is intriguing, but the pace and writing style are getting to me. Hoping for an explosive ending to save the day. Review forthcoming! Here's hoping for more reading time in the coming weeks, especially because I have a few blog tour books to complete in October! In the meantime, hopefully things will settle down here, and these two books will get a bit more enjoyable for me. How is your reading life these days, friends? Any other parents still adjusting to school schedules? Oh, I hear ya on the September craziness! I feel like it's a couple weeks of kind of starting the new routines, but not really (my kids have these "phase in" periods where they don't go to school for the full hours in the beginning...ugh! ), and we're just now getting the real routine going. It's crazy how long the "start of school" actually drags out. Anyway - I love the title of this post! Woo! I'm finally starting to get back into gym classes at Cornell and I'm also really enjoying yoga. My other favorite is zumba, but I haven't tried a spin class yet. Unfortunately, I'm feeling the same way about The Sixth Extinction. I've been feeling slightly less bogged down in the second half, but the organization is really not working for me. I have yet to try Zumba...I am rather uncoordinated and wonder how I would do with it...haha! My cousin is a BodyPump instructor and wants me to try that, so that may be my next venture. I knew you would approve! ;) I did a Music Together class for 2 "terms" with Small Fry a couple years ago...he really loved it, and I figured it would be nice for Tater Tot to get the same exposure. I am NOT musical at all, but my husband is, and I would love for that to rub off on the boys!